No one likes to slip in to a cold bed at night or during the day if you are lucky enough to get a nap. After a while, our body heat will keep the bed warm, but it can a chilly experience until you get to that point. I am going to walk you through how to make a bed warmer that you just pop in the microwave for a few minutes before you put it on your bed. No need to have an expensive electric blanket or mattress pad heating up your whole bed when this can do the job for cheaper. You can alter the measurements of the bed warmer to make a hot/cold pad to put on injuries. Consider making it half the width but the same length if you would like a hot/cold pad to wrap around across your next and over both shoulders. 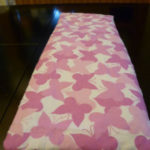 Or make one with half the length but the same width if you would like a hot/cold pad to put on your back or another body part. Step 1. Use a piece of fabric that will respond well to heat and has a tight weave. Cotton or flannel would be perfect. I chose to use a flannel fabric for the outside. Check out remnant pieces at fabric stores to cut your cost. Mine was a remnant that I paid 60-cents for. Cut your piece to your desired size. I cut mine 8″x21″. Cut 2. Step 2. 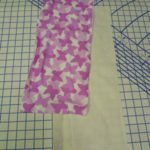 Cut 2 pieces of the same size fabric in a cotton of cotton muslin for the inside liner. Be sure you pick a color that will not show through your outside fabric. Step 3. Layer your pieces in the following order: outside pieces with right sides facing together, then liner pieces on top and bottom of stack. See the picture to the left. It is important that you place the outside pieces with right sides together in the center, because after stitching you will be turning it right sides out and you want to be sure your outside pieces are where they are supposed be. Step 4. 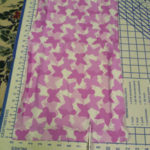 Stitch around the perimeter with 1/2″ seam on all 4 sides, leaving a 1-2″ space open at the end of the 4th side. 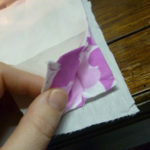 Consider doing a double seam to prevent leakage. 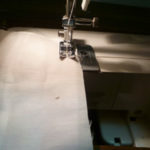 Stitch the second seam at 1/4″. You need to allow this space so you can pour in your rice/beans/corn/buckwheat. Clip all four corners. This will help make an even corner without puckering. Pull the fabric from the inside through the opening so that right sides are now facing out. Use a pencil (eraser end) to push the corners out square. Step. 5. Fill the warmer with 7 cups of your choice of filler. 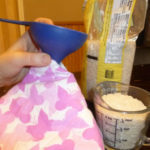 I chose rice and a 3 pound bag of rice is roughly 7 cups. Hand stitch or machine stitch the opening closed. You could add dried lavender when you add the fill, if you would like it scented. Lavender is supposed to be very relaxing. Instructions: To use the bed warmer to heat your bed, all you need to do is microwave it for 3 minutes. To use a hot pad, I like to microwave it for only 2 minutes since it is going directly on your skin. To use as a cold pad, place it in your freezer for an hour or two before using. Be sure to check out Save Green Being Green, to see more crafts that I have made, including these Counting Bean Bags and our Backyard Xylophone. That’s pretty neat! I had no idea you could make a bed warmer filled with something like rice. Very cool! So handy and very cute! thanks for the post! Thanks! I have a heat pack we bought years ago but there are so many holes that the insides are falling out all the time. I patched it up repeatedly and finally recovered the whole thing. But I told my husband that we need to keep our eyes out to buy a new one. Except now I don’t have to! I can make one, thanks! I have found rice to be the best filler. Corn will pop if it’s heated too long. Buckwheat hulls are harder to find and mine leached a fine brown powder through all the layers of fabric. Rice is affordable and easy to find at the grocery store. I tuck a cold one inside my pillowcase on a hot summer night. Also, I make mine with a removable washable outer cover. That is good to know about the Buckwheat. I often see pillows made of buckwheat as “travel pillows” available to buy and have considered it. Good idea to make a cover for it that is washable, I bet make a pillowcase for it would be good to have when using it on an area that you might have put some kind of lotion/cream/gel. I love the heat pads, but it never has occurred to me to make one. I might try this with my daughter who seems to have the itch to learn to sew. I’m letting her down. It is somewhat of a lost art. When we moved to Buffalo, NY from Texas I made these for everyone to warm their beds at night. Brrrrr, our house gets chilly at night, but these really help. A great – and frugal- suggestion. Thanks!